Directed by Robert Wise. Written by Edmund North (based on a story by Harry Bates). 1951. Running time: 92 minutes. WARNING: This article contains several spoilers and plot details. If you are planning on seeing The Day the Earth Stood Still it is recommended that you don't read any further . 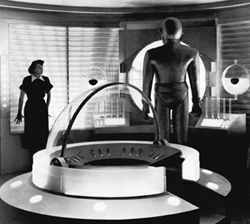 . .
One critic remarked of The Day the Earth Stood Still that, for a movie with avowedly liberal leanings, it has a rather strange attitude towards the role of violence in controlling people. For starters, it is rather favorable towards the concept . . . The big problem for said critic comes in with the statement by the visiting alien Klaatu (played with a certain elan by Michael Rennie) towards the end of the movie when it is revealed that he represents a galactic federation of sorts - a plethora of various worlds - all of them held in check by a race of super robots (represented by the huge silver robot Gort) which they had had built and designed themselves. These robots keep the galactic peace - if a particular planet shows aggressive behavior towards its neighbouring or other worlds, then they are immediately attacked by said super robots. Think of a sort of galactic United Nations backed up by serious hardware - in this case said robots, which fire laser beams from their eyes - and you get the idea. At first glance this may seem to be acceptable, but it doesn't hold up to closer scrutiny. We would all like the aggressors and bullies to be punished and halted in its tracks. Imagine having some competent school prefects around on your primary school playground that simply stopped the other bigger kids from beating the crap out of you! Wouldn't that have been cool? But The Day The Earth Stood Still is mostly informed by such school playground metaphysics - it simply doesn't not hold up to the real world which isn't black and white at all . . .
"The desire for god-like aliens to sort our problems for us is very strong in celluloid science fiction." A bomb goes off in a popular night-club killing several clubbers - including a woman. Clearly the people who planted the bomb are in the wrong and should be brought to justice. But what if I told you that the people who planted that particular bomb represented more than two-thirds of that country's population who have no voting rights? Who is in the wrong now? The club's name is Magoo's and it is mid-1980s. It was planted by the military wing of the ANC opposed to the then South African apartheid regime. See what I mean about a certain race of super robots going around and neutralising aggressors? Not that The Day the Earth Stood Still equates this race of robots with the post-WWII international role of the United States. However, the analogy is inescapable and the question lingers: if we can't manage to have impartial global policemen, then who says alien races will get it right? The main message of The Day the Earth Stood Still is that we Earthlings should set our differences aside and act as a planet - not as a loose confederation of nation states. When Klaatu's flying saucer lands in Washington D.C. it is clear to humanity that the pond has just gotten bigger and that we can no longer think of ourselves as Americans, Russians, Canadians, Brazilians, South Africans or whatever. 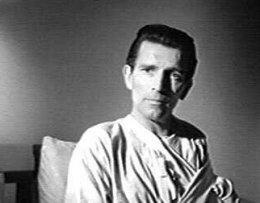 Alas, when Klaatu asks for a conference of world leaders to hear him out nobody would comply. It is the height of the Cold War and the Russians refuse to sit down with the Americans at the same table and vice versa. Klaatu gets the world's attention by incredibly shutting down all electricity (except in cases where it might be life threatening) around the world. The earth literally stands still for a day! But it is a show of force by superior technology, the equivalent of being the only nation of Earth to have the atomic bomb and dropping it on two major cities - to end a seemingly endless war, true, but also to impress future enemies (in this case, Soviet Russia under Stalin). The desire for god-like aliens to sort our problems for us, either by direct action or by leading example is very strong in celluloid science fiction. It is a strong theme in The Abyss - Special Edition and the idea of benevolent aliens was also touched upon in the likes of The Fifth Element, Close Encounters of the Third Kind, Star Trek - First Contact, Contact and 2001: A Space Odyssey (humans evolving to a next step in evolution thanks to the interference of an alien race). However, moral relativity remains the hallmark of international political discourse in the 20th century and probably will remain so in the 21st as well - despite the current so-called "idealpolitik" efforts by the West in Kosovo, East Timor and elsewhere. When The Day The Earth Stood Still was made, it was 1951 and America has just helped defeat the morally repugnant and evil Nazi Germany. Back then it was easy to believe in moral absolutes - of black & white issues - Vietnam was still a long way off. Hitler was clearly evil - but was Ho Chi Minh who led a movement that was clearly more populist nationalist in nature than communist? The school playground has just turned several shades of grey . . .